Area: 582,000 sq. km. (224,710 sq. mi. ), about the size of Texas. Cities (2011 census): Capital: Gaborone (pronounced ha-bo-ro-neh), pop. 227,333. Other towns — Francistown (100,079), Selebi-Phikwe (49,724), Molepolole (63,128), Kanye 45,196) Serowe (47,447), Mahalapye (41,316), Lobatse (29,032), Maun (55,784), Mochudi (44,339). Nationality: Noun and adjective: Motswana (sing. ), Batswana (pl.). Annual population growth rate (2009): 1.5%. Ethnic groups: Tswana 79%; Kalanga 11%; Kgalagadi, Herero, Bayeyi, Hambukush, Basarwa ("San"), Khoi, whites 10%. Religions: Christianity 70%, none 20%, indigenous beliefs 6%, other 4%. Languages: English (official), Setswana, Ikalanga. Health (2011): Life expectancy: 58.05 years. Infant mortality rate — 11.14/1,000. Work force (2005-2006 est. ): 548,600 employed; total including unemployed, 651,500. Branches: Executive: president (chief of state and head of government), cabinet. Legislative — popularly elected National Assembly; advisory House of Chiefs. Judicial — High Court, Court of Appeal, local and customary courts, industrial labor court. Administrative subdivisions: Five town councils and nine district councils. Major political parties: Botswana Democratic Party (BDP), Botswana Movement for Democracy (BMD), Botswana National Front (BNF), and Botswana Congress Party/Botswana Alliance Movement. Nominal GDP (2010): $14.8 billion. Real GDP growth rate (2010): 7.5%. Per capita nominal GDP (2009 est. ): $6,200. Natural resources: Diamonds, copper, nickel, coal, soda ash, salt, gold, potash. Agriculture (2% of real GDP, 2008): Products — livestock, sorghum, white maize, millet, cowpeas, beans. Industry: Types: mining (40% of real GDP, 2008): diamonds, copper, nickel, coal; tourism, textiles, construction, beef processing, chemical products production, food and beverage production. Trade (2008): Exports: $5.127 billion f.o.b. : diamonds, nickel, copper, meat products, textiles, hides, skins, and soda ash. Partners — EU, South Africa. Imports — $3.931 billion f.o.b. : machinery, transport equipment, manufactured goods, food, chemicals, fuels. Major suppliers — South Africa, EU, and U.S.
Batswana, a term also used to denote all citizens of Botswana, refers to the country's major ethnic group (the "Tswana" in South Africa), which came into the area from South Africa during the Zulu wars of the early 1800s. Prior to European contact, the Batswana lived as herders and farmers under tribal rule. In the 19th century, hostilities broke out between the Batswana and Boer settlers from the Transvaal. After appeals by the Batswana for assistance, the British Government in 1885 put "Bechuanaland" under its protection. The northern territory remained under direct administration and is today's Botswana, while the southern territory became part of the Cape Colony and is now part of the northwest province of South Africa; the majority of Setswana-speaking people today live in South Africa. In June 1964, Britain accepted proposals for democratic self-government in Botswana. 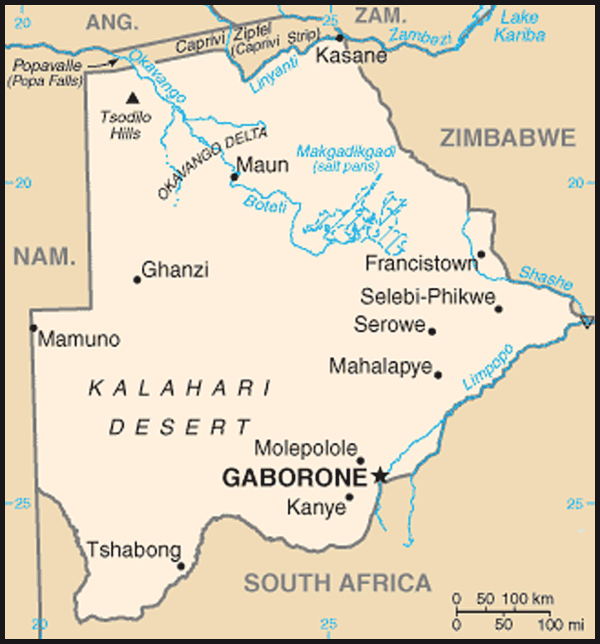 The seat of government was moved from Mafikeng, in South Africa, to newly-established Gaborone in 1965. The 1965 constitution led to the first general elections and to independence in September 1966. General elections serve to elect members of parliament, and the presidential candidate from the party that wins the most seats in the general election becomes the president. Seretse Khama, a leader in the independence movement and the legitimate claimant to traditional rule of the Bamangwato, became the country's first president, was re-elected twice, and died in office in 1980. The presidency passed to the sitting vice president, Ketumile Masire, who was elected in his own right in 1984 and re-elected in 1989 and 1994. Masire retired from office in 1998. The presidency passed to the sitting vice president, Festus Mogae, who was elected in his own right in 1999. Mogae won a second term in elections held October 30, 2004 and stepped down in accordance with national term limits on March 31, 2008. On April 1, 2008 former Vice President Ian Khama assumed the presidency. Khama was elected as President in his own right during the general election held on October 16, 2009. Botswana has a flourishing multiparty constitutional democracy. General elections are held every 5 years. Each of the elections since independence has been freely and fairly contested and has been held on schedule. The country's minority groups participate freely in the political process. The openness of the country's political system has been a significant factor in Botswana's stability and economic growth. The president of Botswana is indirectly elected. The presidential candidate from the political party that wins the majority of the 57 seats in the National Assembly is sworn in as president. The cabinet is selected by the president from the National Assembly; it consists of a vice president and a flexible number of ministers and assistant ministers. The National Assembly has 57 elected and 4 specially elected members; it is expanded following each 10-year census. There are four main parties and a number of smaller parties. In national elections held October 16, 2009, the Botswana Democratic Party (BDP) won 45 of 57 contested National Assembly seats, the Botswana National Front (BNF) won 6 seats, and the Botswana Congress Party (BCP)/Botswana Alliance Movement pact won 5 seats. For the first time in the history of the country, an independent candidate won a seat in parliament during the 2009 election. Four additional seats filled by individuals elected by the National Assembly went to the ruling BDP. In the city of Gaborone, the BDP took all but one of the five constituencies from the opposition, taking control of the city council. In May-July 2010, 7 BDP parliamentarians and the lone independent changed their membership to the newly created Botswana Movement for Democracy (BMD). In August 2010, 2 BMD members returned to the BDP, leaving the BMD with 6 seats in parliament. The advisory House of Chiefs represents the eight principal subgroups of the Batswana tribes, five members specially elected by the president, and 22 members elected from designated regions. The eight principal chiefs are members for life, while the elected members hold office for a period of 5 years. A draft of any National Assembly bill of tribal concern must be referred to the House of Chiefs for advisory opinion. Chiefs and other leaders preside over customary traditional courts, though all persons have the right to request that their case be considered under the formal British-based legal system. Local government is administered by nine district councils and five town councils. District commissioners have executive authority and are appointed by the central government and assisted by elected and nominated district councilors and district development committees. There has been ongoing debate about the political, social, and economic marginalization of the San (an indigenous tribal population). The government's policies for the Basarwa (San) and other remote area dwellers continue to spark controversy. Botswana maintains an embassy (http://www.botswanaembassy.org/) at 1531-1533 New Hampshire Avenue NW, Washington DC 20036 (tel. 202-244-4990; fax 202-244-4164). Its mission to the United Nations is at 103 E. 37th Street, New York NY 10017 (tel. 212-889-2277; fax 212-725-5061). Botswana has enjoyed one of the fastest growth rates in per capita income in the world since independence, although it slowed considerably due to the global economic downturn. The economic growth rate averaged 9% per year from 1967-2006, but slowed during 2007 and 2008 to only 3% before dropping to minus 3.7% in 2009. In 2010, real GDP grew by approximately 7.5%, and it is expected to post an average growth of 6% in 2011 and 2012. The government reported that the average consumer price inflation rate dropped to 7.0% for 2010 as compared to 8.1% for 2009. The government has maintained a sound fiscal policy and a negligible level of foreign debt. Foreign exchange reserves were estimated to be $8.4 billion in September 2010, representing approximately 19 months' cover of imports of goods and services. Botswana's impressive economic record has been built on the foundation of wisely using revenue generated from diamond mining to fuel economic development through prudent fiscal policies and a cautious foreign policy. The government recognizes that HIV/AIDS will continue to affect the economy and is providing leadership and programs to combat the epidemic, including free anti-retroviral treatment and a nationwide Prevention of Mother-to-Child Transmission program. Debswana (formed by the government and South Africa's DeBeers in equal partnership) is the largest mining operation in Botswana. Several other mining operations exist in the country, including the Bamangwato Concessions, Ltd. (BCL, also with substantial government equity participation) and Tati Nickel. Since the early 1980s, the country has been the world's largest producer of gem-quality diamonds. Four large diamond mines have opened since independence. DeBeers prospectors discovered diamonds in northern Botswana in the late 1960s. The first mine began production at Orapa in 1972, followed by the smaller mines of Lethlakane and Damtshaa. What has become the single-richest diamond mine in the world opened in Jwaneng in 1982. The Orapa 2000 Expansion of the existing Orapa mine was opened in 2000. In December 2004, Debswana negotiated 25-year lease renewals for all four of its mines with the Government of Botswana. Diamond mining accounts for approximately one-third of Botswana's GDP and 70% of export earnings. However, the industry is capital intensive and accounts for less than 5% of private sector employment. The global economic crisis greatly reduced worldwide demand for diamonds, and the government reports that Botswana's diamond sales volume for 2009 was 37% lower than that of 2007. Demand has somewhat recovered, and Debswana plans to increase diamond production by 20% in 2011. Diamond mining will continue to be the mainstay of Botswana's economy, with known current reserves sufficient for at least the next 20 years. Exploration for additional kimberlite pipes continues. As part of Botswana's drive to diversify and increase production of value-added goods within the mining sector, De Beers opened the Diamond Trading Center Botswana (DTCB) in 2008 to localize some sorting, cutting, polishing, and marketing. Through DTCB, 16 diamond cutting and polishing firms obtain diamonds (about 20% of the total). Known as "sightholders", these firms have opened cutting and polishing factories in Botswana, creating roughly 3,000 jobs. In 2011, DeBeers and the Government of Botswana announced that they had agreed to shift DeBeers' aggregation and sorting operation from London to Gaborone by 2013, effectively making Gaborone the major sales point for the company's diamonds. This will bring additional jobs to Botswana and may entail additional opportunities for diamond cutters, polishers, and jewelers. BCL, which operates a copper-nickel mine at Selebi-Phikwe, has had a troubled financial history but remains an important employer, although the life of the mine is expected to end in the next 5 to 10 years. Other copper-nickel mines include Tati Nickel near Francistown. Botash, the sole producer of soda ash in the region and supported by substantial government investment, produced 215,000 tons of soda ash in 2009. Coal-bed methane gas has been discovered in the northeastern part of the country, estimated by the developers at a commercially viable quantity of 12 trillion cubic feet. Development of the gas fields has been slow, however. Tourism is an increasingly important industry in Botswana, accounting for approximately 11% of GDP, and has grown at an annual rate of 14% in the past 8 years. One of the world's unique ecosystems, the Okavango Delta, is located in Botswana. The country offers excellent game viewing and birding both in the Delta and in the Chobe Game Reserve — home to one of the largest herds of free-ranging elephants in the world. Botswana's Central Kalahari Game Reserve also offers good game viewing and some of the most remote and unspoiled wilderness in southern Africa. More than one-half of the population lives in rural areas and is largely dependent on subsistence crop and livestock farming. Agriculture meets only a small portion of food needs and makes up only 2.3% of GDP — primarily through beef exports — but it remains a social and cultural touchstone. Cattle raising in particular dominated Botswana's social and economic life before independence. The national herd is estimated between 2 and 3 million head, but the cattle industry is experiencing a protracted decline. Botswana seeks to further diversify its economy away from minerals, which accounts for more than one-third of GDP. Foreign investment and management are welcomed in Botswana. Botswana abolished foreign exchange controls in 1999, has a low corporate tax rate (15%), and has no prohibitions on foreign ownership of companies. 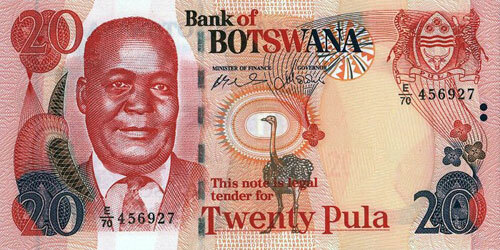 Botswana's currency — the Pula — is fully convertible and is valued against a basket of currencies heavily weighted toward the South African Rand. Profits and direct investment can be repatriated without restriction from Botswana. With its proven record of good economic governance, Botswana was ranked as Africa's least corrupt country by Transparency International in 2010 (33rd out of 178 countries, ahead of many European and Asian countries). Botswana is consistently ranked by international organizations as among the freest economies in sub-Saharan Africa. The Heritage Foundation's 2010 Index of Economic Freedom ranked Botswana at 28th in the world with a score of 70.3, the best of any country in sub-Saharan Africa. In 2011, Moody's preserved Botswana's A2 credit rating due to the government's refusal to give in to striking public sector workers, and Botswana is viewed as one of the best credit risks in Africa, on par with many countries in central Europe, East Asia, and Latin America. U.S. investment in Botswana remains at relatively low levels. Major U.S. corporations, such as Hewlett-Packard, H.J. Heinz, and AON Corporation, are present through direct investments, while others, such as Kentucky Fried Chicken and Remaxx, are present via franchise. Because of history and geography, Botswana has long had deep ties to the economy of South Africa. The Southern Africa Customs Union (SACU), comprised of Botswana, Namibia, Lesotho, Swaziland, and South Africa, dates from 1910, and is the world's oldest customs union. Under this arrangement, South Africa has collected levies from customs, sales, and excise duties for all five members, sharing out proceeds based on each country's portion of imports. The exact formula for sharing revenues and the decision-making authority over duties — held exclusively by the Government of South Africa — became increasingly controversial, and the members renegotiated the arrangement in 2001. A new structure was formally ratified and a SACU Secretariat was established in Windhoek, Namibia. Following South Africa's accession to the World Trade Organization (WTO, of which Botswana also is a member), many of the SACU duties are declining, making American products more competitive in Botswana. Botswana signed an Economic Partnership Agreement with the European Union in December 2007, and, as a member of SACU, it signed a preferential trade agreement in 2004 with Mercosur. Botswana is a member of the 15-nation Southern African Development Community (SADC), and Gaborone hosts the SADC Secretariat's headquarters. SADC has a broad mandate to encourage growth, development, and economic integration in Southern Africa. SADC's Trade Protocol, calls for the elimination of all tariff and non-tariff barriers to trade among the 12 signatory countries. However, implementation of the protocol has been slow and is not yet complete. A sparsely populated, semi-arid country about the size of Texas, Botswana has nonetheless managed to incorporate many rural areas into the national economy. An "inner circle" highway connecting all major towns and district capitals is completely paved, and the all-weather Trans-Kalahari Highway connects the country (and, through it, South Africa's commercially dominant Gauteng Province) to Walvis Bay in Namibia. A fiber-optic telecommunications network has been completed in Botswana connecting all major population centers. The Civil Aviation Authority of Botswana (CAAB) has been established as a regulator of the air transport services to further enhance the transport system. In addition to the government-owned newspaper and national radio network, there is an active, independent press (one daily and seven weekly newspapers). Two privately owned radio stations began operations in 1999, and a third began operations in 2008. In 2000, the government-owned Botswana Television (BTV) was launched, which was Botswana's first national television station. GBC is a commercially owned television station that broadcast programs to the Gaborone area only. Foreign publications are sold without restriction in Botswana, and there are 22 commercial Internet service providers. Three cellular phone providers cover most of the country. The president is commander in chief of the Botswana Defense Force (BDF). A defense council is appointed by the president. The BDF was formed in 1977 and has approximately 13,000 members. The BDF is a capable and well-disciplined military force. Following positive political changes in South Africa and the region, the BDF's missions have increasingly focused on border control and anti-poaching activities. The BDF is considered an apolitical and professional institution. Botswana puts a premium on economic and political integration in Southern Africa. It seeks to make SADC a working vehicle for economic development, and promotes efforts to make the region self-policing in terms of preventative diplomacy, conflict resolution, and good governance. Botswana often joins the African consensus on major international matters, but frequently takes its own stand on issues it views as matters of principle. 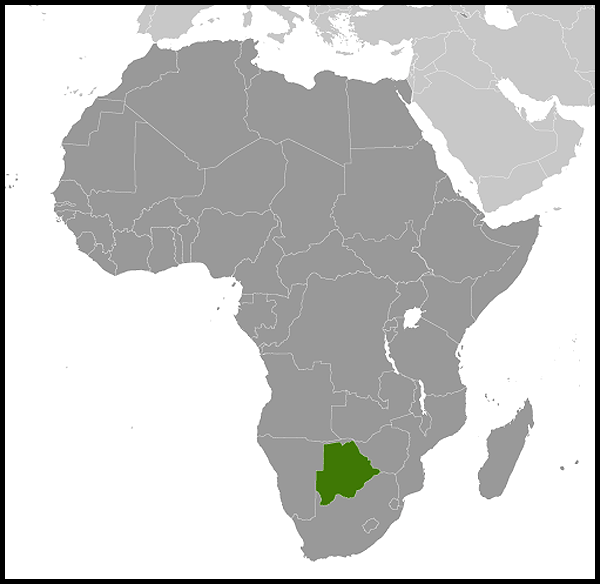 Botswana is a member of international organizations such as the United Nations and the African Union (AU). Botswana has taken a leadership role within SADC advocating for a resolution of the crisis in Zimbabwe that fully reflects the will of the Zimbabwean people. The United States considers Botswana an advocate of and a model for stability in Africa and has been a major partner in Botswana's development since its independence. The U.S. Peace Corps returned to Botswana in August 2002 with a focus on HIV/AIDS-related programs after concluding 30 years of more broadly targeted assistance in 1997. Similarly, the U.S. Agency for International Development (USAID) phased out a longstanding bilateral partnership with Botswana in 1996, after successful programs emphasizing education, training, entrepreneurship, environmental management, and reproductive health. Botswana, however, continues to benefit along with its neighbors in the region from USAID's Initiative for Southern Africa, now based in Pretoria, and USAID's Southern Africa Trade Hub, headquartered in Gaborone. The United States' International Board of Broadcasters (IBB) operates a major Voice of America (VOA) relay station in Botswana serving most of the African continent. In 1995, the Centers for Disease Control (CDC) started the BOTUSA Project in collaboration with the Botswana Ministry of Health in order to generate information to improve tuberculosis (TB) control efforts in Botswana and elsewhere in the face of the TB and HIV/AIDS co-epidemics. Under the 1999 U.S. Government's Leadership and Investment in Fighting an Epidemic (LIFE) Initiative, CDC through the BOTUSA Project has undertaken many projects and has assisted many organizations in the fight against the HIV/AIDS epidemic in Botswana. Botswana is one of the 15 focus countries for PEPFAR, the President's Emergency Plan for Aids Relief. PEPFAR has been supporting the Botswana national response since 2004 through technical assistance and financial support totaling more than $480 million. PEPFAR assistance to Botswana, which totaled over $87 million in FY 2010, supports sustainable, high-quality, cost-effective HIV/AIDS prevention, treatment, and care interventions. The International Law Enforcement Academy (ILEA), situated just outside of Gaborone, is another example of bilateral cooperation. The academy, jointly financed, managed, and staffed by the Governments of Botswana and the United States, provides training to police and government officials from across the sub-Saharan region. The academy's permanent campus, in Otse outside of Gaborone, opened March 2003. Over 4,300 law enforcement professionals from 26 countries in sub-Saharan Africa have received training from ILEA since it began offering classes in 2001. The U.S. Embassy (http://botswana.usembassy.gov/) is on Embassy Drive off Khama Crescent — P.O. Box 90, Gaborone (tel. 267-395-3982; fax 267-395-6947). OSC is located at the embassy. CDC is located on Lejara Road, Phase 2 in Gaborone. ILEA is located in Otse, about 45 minutes outside of Gaborone. The IBB station is located in Selebi-Phikwe, about 400 kilometers northeast of Gaborone.